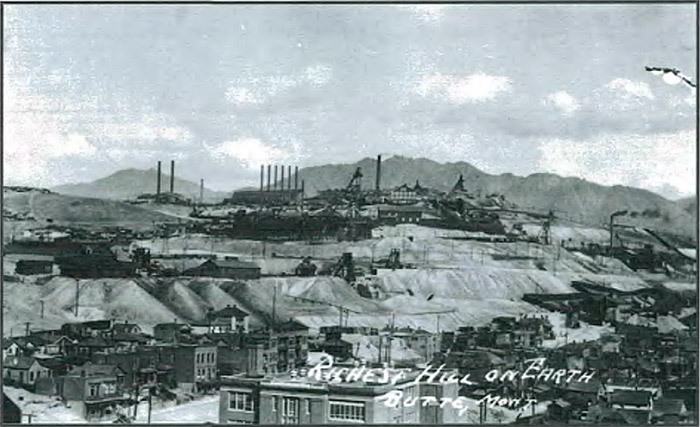 Historically, Butte, Montana has been an important mining, milling, and smelting district. Gold was first discovered near Butte in 1864. More than 100 years of mining have resulted in the development of over 500 mines, 120 major waste rock dumps, 3,000 miles of underground workings, and the Berkeley Pit with its ancillary tailings ponds, waste dumps, and acid leach pads. Operation of 12 silver mills and 15 copper and zinc concentrators/smelters resulted in the production of a variety of smelter wastes and tailings. The Silver Bow Creek/Butte Area Superfund Site, which includes the Butte Priority Soils Operable Unit (BPSOU), represents one of four contiguous Superfund sites in the upper Clark Fork River Basin. These sites extend 140 miles from the headwaters of Silver Bow Creek (north of Butte) to the Milltown Reservoir near Missoula, Montana. The Silver Bow Creek/Butte area site lies immediately west of the continental divide in southwestern Montana, at the easternmost extent of the upper Clark Fork River drainage. The site encompasses approximately 85 square miles, including the entire length of Silver Bow Creek and associated land contamination from Butte westward approximately 25 miles to the Warm Springs Ponds near Anaconda. The site incorporates several square miles of land area within the city of Butte, Montana. The BPSOU lies within the Butte portion of the Silver Bow Creek/Butte Area site, encompassing the town of Walkerville, the part of Butte north of Silver Bow Creek and west of the Berkeley Pit, and a section of land that extends south from Silver Bow Creek to Timber Butte (Figure 11-13). USEPA is the lead agency and the Montana Department of Environmental Quality (DEQ) is the support agency for the BPSOU. Figure 11‑13. BPSOU site map. The Butte area is underlain by granite rocks of the Boulder Batholith. These rocks are primarily quartz monzonite intersected by porphyritic dikes and plugs (Botz and Knudson 1970). These granite rocks are fractured and faulted with resulting mineralization and alteration. A weathered zone is generally present in the upper 100 to 200 feet of bedrock, which is underlain by a deep sulfide zone containing disseminated and vein deposits of copper and other metals, such as lead (Botz and Knudson 1970). Unconsolidated alluvial deposits are present in valleys and drainages throughout the area, specifically along Silver Bow Creek and the drainages along the East Ridge. The thickness of these unconsolidated deposits varies from a few feet to several hundred feet. These materials are fluvial or alluvial fan origin and consist of discontinuous layers and lenses of sandy clay, clayey silty sand, and sand and gravel (Botz and Knudson 1970). The thickness of the sand and gravel layers is reported to range from 2 to 20 feet. 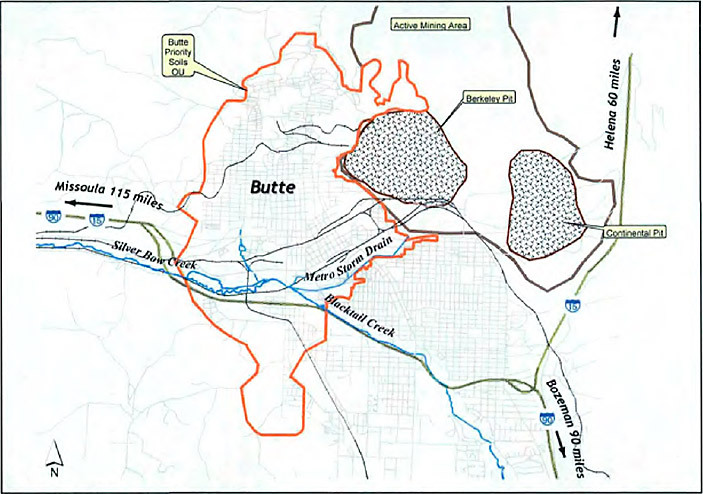 The BPSOU is centered on Butte Hill (Figure 11-14), which is the location of the historic Butte Mining District. Contaminants at the site, including arsenic and heavy metals, such as copper, lead, mercury, and zinc, are the result of hard rock mining, smelting, milling, and other processing activities. Mining and ore-processing wastes in Butte represent the primary source materials. These wastes include mill tailings, waste rock, slag, smelter fallout, and mixed combinations of each. Metals from these wastes pose significant risks to human and ecological receptors. Although several chemicals of concern were identified at the site, this case study summarizes the risk characterization approach and results for lead. The sources of lead in the BPSOU are waste rock dumps, railroad beds constructed of mine waste, mine tailings, smelter emissions, and other mine-related materials associated with past Butte mining, milling, and smelting activities. Wind erosion and surface water runoff have also resulted in transport of lead to residential yards and parks. The soil, mine waste, air, surface water, and groundwater media at the BPSOU have been the subjects of studies since the late 1960s. Numerous investigations concerning surface soil and surface mine waste have been conducted to examine the chemical characteristics of soil within residential and commercial areas, mine waste rock dumps, tailings accumulations, and railroad grades within the BPSOU. Electron microprobe analysis of Butte soils taken mainly from waste rock deposits (Hemphill et al. 1991) indicate that galena (PbS) and its alteration product anglesite (PbSO4), which was found to encapsulate the galena, are the primary forms of lead in soil. Also, many particles were found to be encapsulated within a pyrite or silicate matrix. The BPSOU is situated in an urban setting and includes residential neighborhoods, schools, and parks, as well as commercial and industrial areas. The northern portion of the BPSOU includes residential and commercial development and inactive mining operations. Light industrial activity, scattered residences, and the Silver Bow Creek floodplain characterize the central portion of the BPSOU. The southern portion is characterized by residential areas, inactive mining operations, cemeteries, and undeveloped land. The land use of the BPSOU is primarily residential. The subpopulations of concern for the BPSOU are residential children (age 0-6 years), who are particularly susceptible to lead contamination, and women of child-bearing age. The primary site-specific exposure pathways of concern are incidental ingestion and inhalation of lead in residential soil, indoor dust, and ingestion of lead in drinking water; exposures that are not site specific (for example, lead-based paint, diet, air) are also included in the lead exposure models used to characterize potential risks in the BPSOU. Several human health risk assessments (HHRAs) have been conducted for areas within the BPSOU. This case study summarizes the baseline HHRA for lead performed to support expedited response actions in the BPSOU in 1994 (USEPA 1994b) and the supplemental Walkerville HHRA performed in 2001 (USEPA 2003a). The approach and results of each HHRA area discussed separately below to illustrate how the methods for characterizing lead bioavailability differed in each HHRA. The soil, dust, water, and blood lead data used in the development of the 1994 HHRA were gathered during the Butte-Silver Bow County Environmental Health Lead Study (EHLS) performed jointly by the Butte-Silver Bow Department of Health and the University of Cincinnati. Soil samples were collected from 147 residences (approximately 8 to 12 samples for each soil area). Four types of soil samples were taken: house perimeter, play area, bare area, and garden. The average lead concentration in outdoor soil ranged from 50 to 3,123 ppm. Older homes in Butte and Walkerville often have copper water pipes joined with leaded solder. The EHLS included collection and analysis of overnight and 30-minute stagnation water samples to help assess possible lead exposures from this lead source. Tap water concentrations of lead ranged from 0.9 to 22.4 µg/L. The EHLS also included the collection and analysis of interior dust samples composited from several floor areas. These samples represented areas frequented by children and consisted of the floor area inside the main entrance way, the floor area in the most frequently occupied room, and the floor area in a child’s bedroom. Lead concentrations in indoor dust samples ranged from 199 to 3,526 ppm. The site-specific lead bioavailability was investigated using both in vivo analyses and in vitro analyses. Samples derived from Butte were used in two rat feeding studies (Johnson et al. 1991; Freeman et al. 1992) conducted by Battelle Columbus Operations under contract to the Atlantic Richfield Company (ARCO; the responsible party for the site). The source of these samples was predominantly waste rock. Both rat studies were well conducted; however, several problems with both studies prevented the direct application of the resulting bioavailability values. The choice between rat or swine models (Weis and LaVelle 1991), the dosing material, the doses selected, and the mixing of the dosing substance with feed all suggested that lead bioavailability data derived from these studies represent lower-bound estimates of potential lead bioavailability. The possible relative effect of the form of lead and the mineralogy of Butte soils was examined in an in vitro study (Davis, Ruby, and Bergstrom 1991; 1992; Ruby et al. 1992). The researchers compared the dissolution of lead from the soil to dissolution of lead from lead acetate, a highly soluble lead salt. Under simulated small intestine conditions, lead was five times less available from Butte soil than from lead acetate. The low availability of lead in soil was attributed to the low solubility of anglesite, kinetic dissolution limitations, encapsulation of anglesite by K-jarosite (KFe3(SO4)2(OH)6), and encapsulation of lead phases by quartz and pyrite. The in vivo rat study showed that blood lead data below the change point (that point where an active or facilitated component of lead uptake may become saturated) (Johnson et al. 1991) resulted in a calculated relative bioavailability (RBA) of 37% for males and 67% for females ingesting the Butte test soil when compared to feed dosed with soluble lead. These estimates were used as the upper-bound for the animal studies. Based on a review of the uptake coefficients for the animals dosed with different waste rock materials, the USEPA Technical Review Workgroup for Lead suggested that the lower range for absolute bioavailability (ABA) for female animals was approximately 9%; after accounting for measurement variability under the experimental conditions employed, the ABA may be as high as 12%. At the time of the 1994 HHRA, version 0.61 of the IEUBK model was used to evaluate exposures from lead-contaminated media in children in a residential setting, which was the primary subpopulation of interest. The IEUBK model is used to predict blood lead concentrations in exposed individuals and estimate the probability of a blood lead concentration exceeding a level of potential concern. The USEPA has identified a blood lead level of 10 µg/dL as the concentration level at which effects begin to occur that warrant avoidance, and has set as a goal that there should be no more than a 5% chance that a child will have a blood lead value above 10 µg/dL (USEPA 1991a). One of the IEUBK model inputs is information on the bioavailability of lead for each exposure medium. The GI bioavailability (ABA) was lowered from the lead model default value (30%) to 12% to reflect the reduced bioavailability of lead in Butte soils. This reduced lead bioavailability was based on the site-specific mineralization study, a soil lead in vitro dissolution study, two in vivo bioavailability studies using rats, and a USEPA evaluation of these studies. Because of the extremely small particle size and lack of site-specific data, dust bioavailability was left at the model default value of 30% bioavailability. IEUBK predictions indicated 73 of 147 residences (50%) modeled for the BPSOU may have environmental lead concentrations that potentially pose an unacceptable risk to a child aged 0 to 6 years. In 2001, USEPA performed a supplemental risk assessment to determine whether arsenic, lead, and mercury in outdoor soil and indoor dust presented an unacceptable health risk to children and adults living in Walkerville, which is a suburb of Butte and located within the BPSOU (USEPA 2003a). The Walkerville HHRA addressed public concerns about mercury contamination. This HHRA also included an evaluation of lead exposures and risks in Walkerville. Three investigations were conducted to collect environmental data in support of the Walkerville HHRA. Over 1,400 samples of outdoor soil, basement soil, living area dust, and attic dust were collected from more than 255 properties in the Walkerville community for analysis of arsenic, lead, and mercury. Table 11-11 presents summary statistics (mean, maximum) for lead concentrations in each type of sample. Lead concentrations tended to be highest in attic dust and lowest in living area dust. Lead concentrations in basement soil tended to be slightly higher than lead concentrations in outdoor soil. Lead concentrations measured in attic dust were about twice the concentrations measured in basement and outdoor soil and about six times the concentrations measured in living area dust. Lead concentrations measured in outdoor and basement soil were about two to three times higher than concentrations measured in living area dust. A study using young swine as test animals was performed to measure the gastrointestinal absorption of lead from a soil sample from the BPSOU. Young swine were selected for use in the study because the gastrointestinal physiology and overall size of young swine are similar to that of young children, who are the population of prime concern for exposure to soil lead. The test soil was a composite collected from within the BPSOU, focusing on the source areas of Little Mina-1, Little Mina-2, West Ruby and North Emma waste rock dumps. The lead concentration of the test soil sample contained was 8,600 mg/kg. The amount of lead present in blood or tissues of animals exposed to the test soil was compared to that for animals exposed to lead acetate, and the results were expressed as RBA. The suggested point estimate of RBA was 0.19 (19%) (Casteel et al. 1998). Available data indicate that fully soluble forms of lead are about 50% absorbed by a child (ABAsoluble is 0.5). Thus, the estimated ABAsoil for lead is 10% (Casteel et al. 1998). The results of the swine study were consistent with those of the bioavailability studies in rats conducted for Butte soils as part of the 1994 BPSOU HHRA. The site-specific ABA value of 10% was used for bioavailability of lead ingested in soil by children. In the Walkerville HHRA, the IEUBK model (version 0.99d) was used to predict blood lead levels for child residents assumed to be exposed to (1) background levels of lead in air, drinking water, and the diet and (2) lead concentrations measured in outdoor soil and indoor dust. Blood lead levels for child residents were predicted for each Walkerville house at which samples were collected for both a high- and low-frequency basement exposure scenario. USEPA’s target (acceptable) blood lead concentration distribution is seen when a typical child or population of children would have a 5% or less probability of exceeding the 10 µg/dL blood lead level of concern (USEPA 1994e). The IEUBK model predicted that USEPA’s acceptable blood level distribution would be exceeded in 89 houses under the high-frequency basement exposure scenario and in 88 houses under the low-frequency basement exposure scenario. For eight houses, the lEUBK model predicted a 50% probability or chance of a child exceeding a blood level of 10 µg/dL. Overall, incidental ingestion of outdoor soil ingestion and living area dust were the primary contributing pathways to blood lead levels in children in Walkerville. For most houses, basement soil did not contribute significantly to blood lead levels in children. The target blood lead distribution recommended by USEPA for a population of women of childbearing age is set such that a typical developing fetus of a resident exposed at the site will have an estimated risk of approximately 5% of exceeding the 10 µg/dL blood lead level of concern (USEPA 1996a). In the Walkerville HHRA, USEPA’s Adult Lead Exposure Model (ALEM) (USEPA 1996a) was used to estimate the probability of a developing fetus having a blood lead level above 10 µg/dL. The probability of exceeding 10 µg/dL was approximately 4% or less for all houses. Therefore, estimated risks were below USEPA’s recommended target blood lead level, indicating that lead in each house at the site does not pose an unacceptable risk to adults. 11.12.9 How Did Bioavailability Results Affect Site Decisions? The remedial action levels for lead were developed according to Risk Assessment Guidance for Superfund (RAGS), Part B (USEPA 1991b). Site-specific inputs were used for lead in soil, house dust, and the bioavailability of lead in soil. An ABA of 10% for lead in soil was used, based on the bioavailability of lead in juvenile swine. The remainder of the risk equation input variables were default values recommended by USEPA guidance and the USEPA toxicologist for the site. Using the IEUBK model, the soil lead concentration which resulted in a blood-lead level of 10 µg/dL or less for at least 95% of the children between the ages of zero and 6 years was determined. Based on these calculations, lead action levels of 1,200 mg/kg for residential soils and 2,300 mg/kg for nonresidential soils were established. The action levels for the cleanup of lead contaminated soils in residential and nonresidential areas within the BPSOU were mandated and published in the Priority Soils Non-Time Critical Removal Action (NTCRA) memorandum (USEPA 1994c) and the BPSOU Record of Decision (ROD) (USEPA 2006b). These RBA results are consistent with the bioavailability studies that supported the 1994 BPSOU HHRA and the 2001 Walkerville HHRA. The BPSOU action levels are based on detailed HHRAs and multiple studies and the unique conditions in Butte. These levels were selected in tandem with other efforts, such as the Residential Metals Abatement Program (RMAP). This multipathway program allows the county’s residential cleanup program to address the various pathways of contamination that may be hazardous to human health and is not limited to soil and dust contamination. The RMAP has been an important community-wide mechanism for identifying and reducing lead exposures from a variety of sources, including lead from site sources as well as lead from other sources, such as such as indoor plumbing, indoor lead-based paint, and exterior lead-based house paint. Medical monitoring is an important component of the RMAP. Blood lead testing at the site began in the early 1990s. Participation in the medical monitoring is encouraged through community awareness and education. Medical monitoring includes the collection of blood lead data to identify individuals who have levels above risk-based thresholds. When individuals are found to have elevated blood lead, the home is prioritized for environmental sampling and evaluation. Table 11-12 summarizes the sampling/inspections and abatements (cleanups) that had been completed through December 2009 (USEPA 2010g). In 2014, a public health study was conducted for the BPSOU (ENVIRON 2014). This study shows that blood lead levels in Butte children have dropped dramatically since 2003. In 2010, the average blood lead level of 1.6 μg/dL was less than half of the average level measured in 2003 (3.5 μg/dL). The percent of blood lead levels above 10 μg/dL declined by about the same amount. The percent of blood lead levels above 5 μg/dL dropped by an even greater amount, decreasing from 34% in 2003 to 10% in 2010. These results demonstrate the lead action levels and RMAP have been effective in reducing blood lead levels within the BPSOU.